We are just a couple of days away from spring break and I am SO ready! Give me the beach, give me the sunshine and sand, give me the days and days without (much) work to do. And give me down time with my family. 💕 Yup, so ready! In the meantime, let’s talk muffin mania. 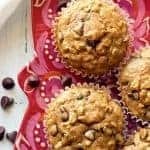 We’ve been on a kick recently of my healthy chocolate chip muffins and my healthy double chocolate banana muffins in the house. 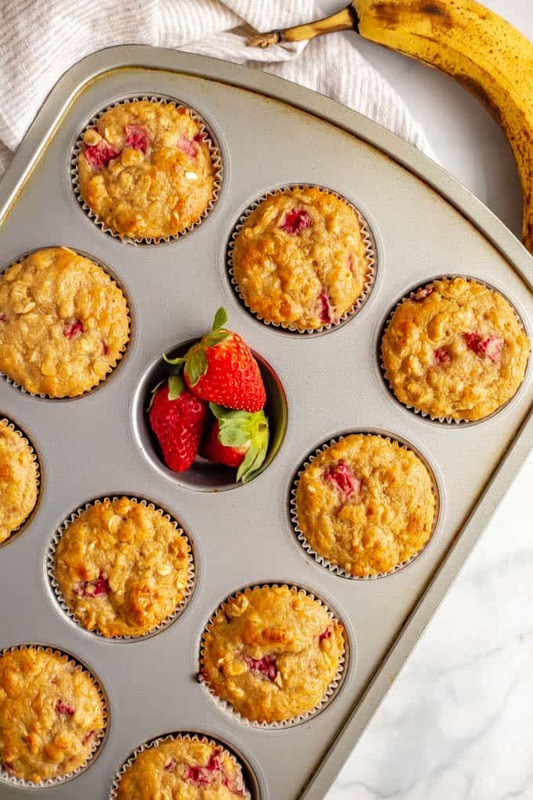 They are light and airy, with the perfect amount of sweetness and strawberry flavor. 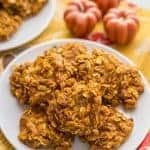 So they’re great for a lighter baked good that you can snack on anytime of day! 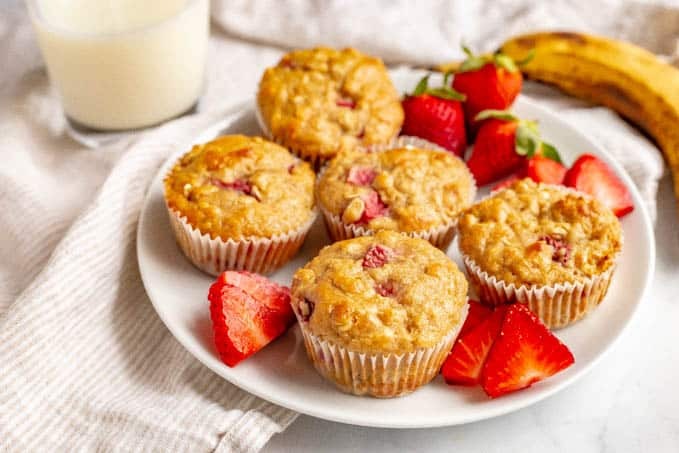 My kids can devour 2-3 of these for breakfast but we also send them for school lunch or have them as an after-school snack. I love that they are portable for busy days! 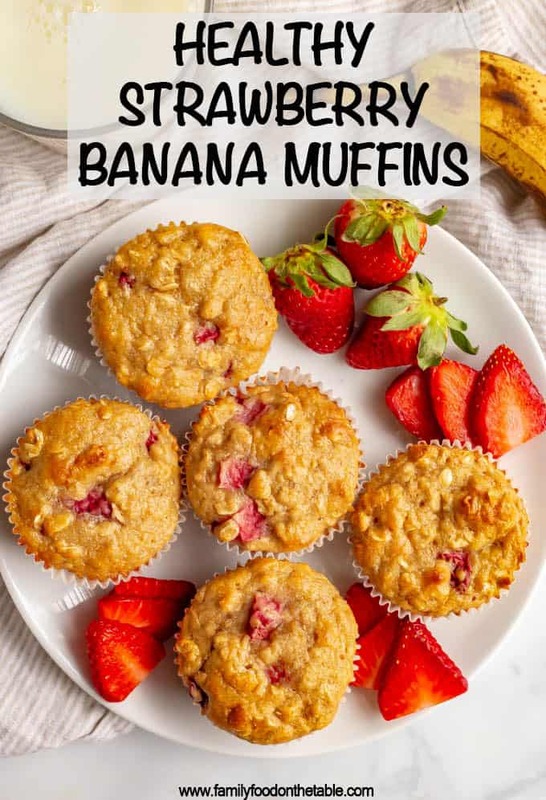 Plus, they are super low-fat and only about 100 calories per muffin – can’t beat that! 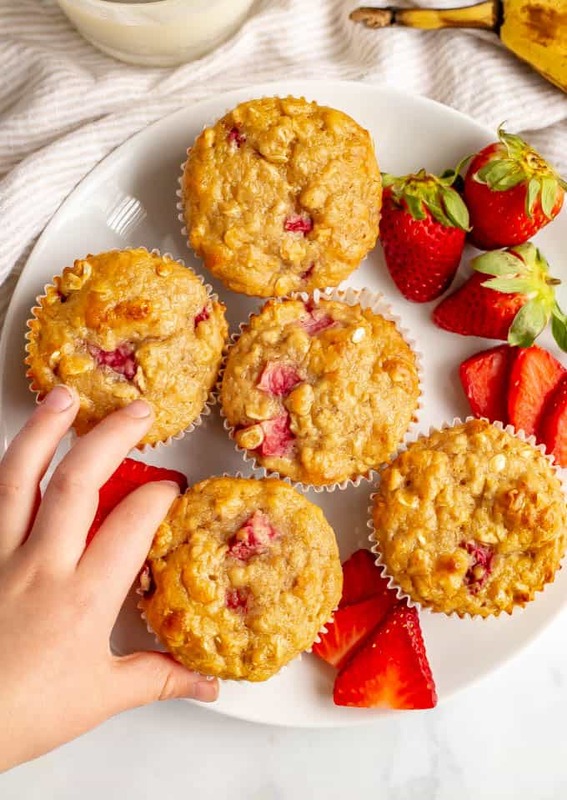 I’ve got some notes, tips and substitutions for you on these muffins coming up. Just trying to be helpful. I use a white whole wheat flour but regular all-purpose flour would be fine as well. 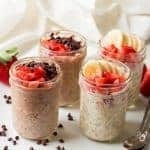 I use old-fashioned rolled oats. Quick cook oats should work fine too. 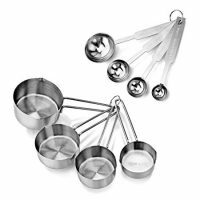 If you have steel cut oats, I’d recommend pulsing them in a blender or food processor to help them break down before mixing them into the batter. 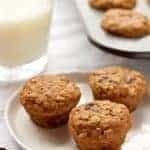 Finally, you could add in some chocolate chips – maybe 1/2 cup or so – if you wanted to give these a chocolate spin! As with all of my low-fat muffin recipes, I think it helps to use liners AND to spray them with a nonstick cooking spray. 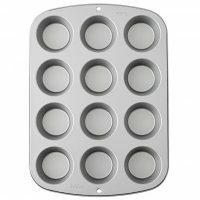 It ensures all your glorious muffin deliciousness will stay together, and not get stuck to the pan or to the liner. 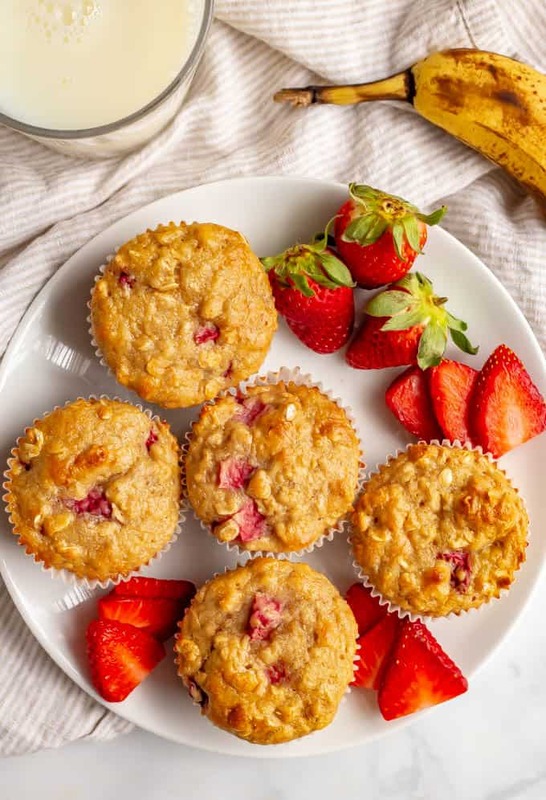 Want to make vegan strawberry banana muffins? Totally do-able. – Use agave or maple syrup in place of the honey. – Use your favorite non-dairy yogurt, such as soy or coconut milk yogurt, in place of the Greek yogurt. This may slightly change the flavor, but the muffins will still be delicious. Oh, and if your vegan yogurt substitute is on the thin or runny side, be sure to strain it to thicken it up so it has a consistency more like Greek yogurt. Daiya apparently makes a vegan Greek yogurt if you can find that. 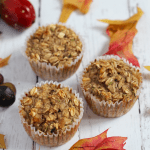 And now, some tips on how to store your extra muffin goodies! 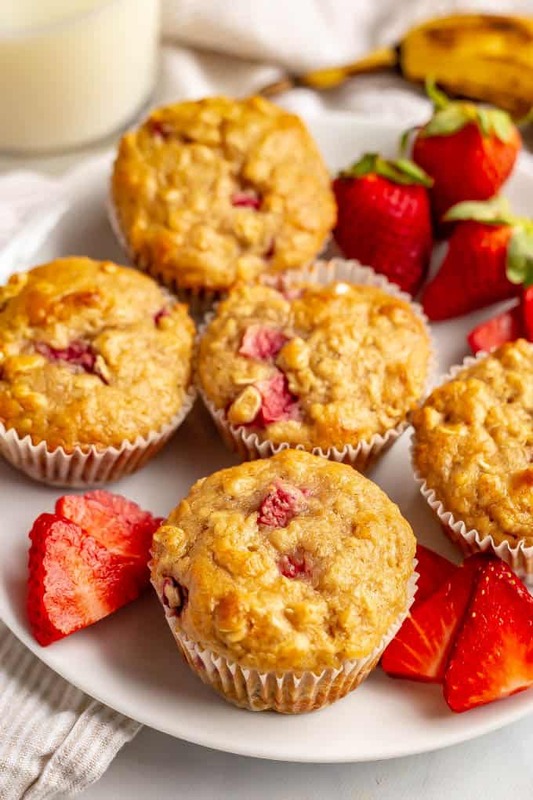 You can store these muffins at room temperature, in a bag or container, for 1-2 days. They’ll keep in the fridge for another 3 days at least. 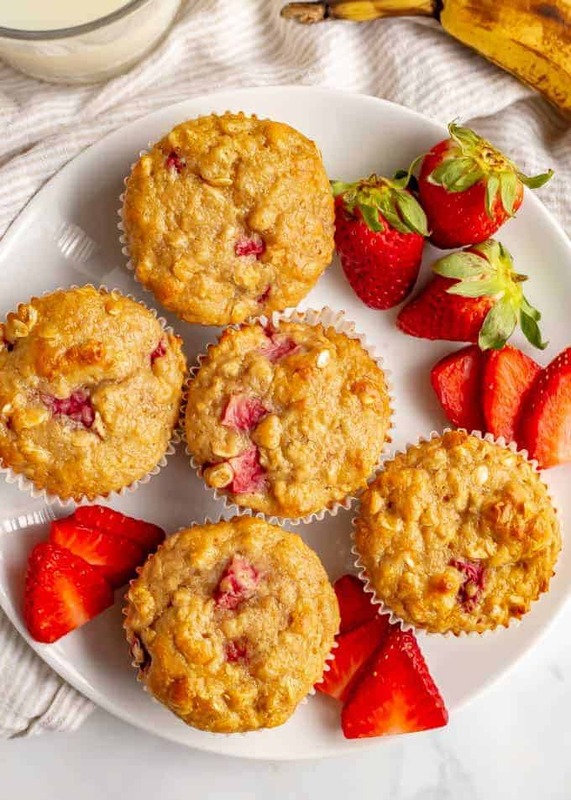 Or, you can freeze these strawberry muffins for up to 6 months. 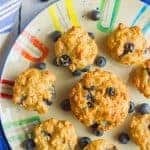 I hope you give these a try next time you are in a baking mood or looking to meal prep some healthy breakfasts or snacks for the week. In a large bowl, combine the flour, oats, baking powder, baking soda and salt. In a medium bowl, mash the ripe banana. Add the Greek yogurt, honey, egg and vanilla and stir well to combine. Add the wet ingredients to the dry ingredients and stir until just combined. Fold in the diced strawberries. Scoop the batter into the muffin liners, filling each about 3/4 full. Bake at 350 for 16-20 minutes, until a toothpick inserted in the center comes out clean. Mine are ready at 18 minutes. 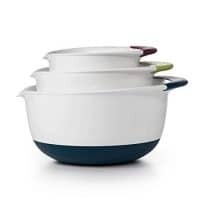 Let cool then store at room temperature for 1-2 days. After that, they are best stored in the refrigerator for another 3-4 days or in the freeze for up to 6 months. I use nonfat plain Greek yogurt here. You could also use a 2% or 5% Greek yogurt if you prefer. 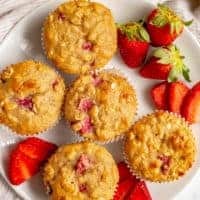 See notes in the post above on how to make these muffins vegan.